Markets worldwide gasped a huge OMG on election night as the polls, like Brexit, got it wrong again. At one point Dow futures were down 900+ points, with gold shooting up $60+, but then after Trump gave his uncharacteristically polite acceptance speech, stocks sighed higher and gold calmed down. In reality, stocks recovered on no contested change of power. Indexes remain at record highs for the moment as offside funds are more worried about bonuses and window dressing returns than the next round of raising the U.S. debt ceiling, or the fiscal cliff coming soon. The Donald seems hell-bent on building walls, roads, to war spending with less tax revenue and higher inflation regardless of the debt bubble. How can this be baked into today's USD? When will gold get its post election Trump pump? Even after last month's sharp gold correction to now below its 200 day moving average (DMA) of around $1,255, most major and mid-tier producers, and developers, have pulled back significantly but are still up multiples of their January lows. While gold bull markets typically last four years and we may only be in the second inning, more churn to finish digesting these gains is likely into year's end. Gold's next catalysts are in December when the Fed should again bump interest rates a quarter point. I still believe they will raise, with one caveat of how markets react to Italy's referendum on the 4th—Brexit was an excuse not to raise rates in June. Italy is not voting to stay or leave the EU, yet, but I'm curious what terms the media coins. As the 24/7 Barnum and Bailey election coverage soon ends, we should hear more about Italexit and Italeave, and later Grexit, Frexit, Oustria, Czech-out etc. Gold also benefits as we get back to worrying about banks, China, ISIS, Syria and Russia's sabre rattling. I'm not adding any larger-cap precious metals names until late December or whenever they finish testing and holding their full 50% Fibonacci retracement level. For example, I wrote a few times about (NYSE:ABX)(TSX:ABX) Barrick Gold since last fall at $7.51, up from its $5.91 summer low, which ran to a $23.47 high this July. Half of that $17.56 or 297% four-bagger gain puts my ABX 50% Fib. support at $14.69. This arguably failed at Monday's $14.64 close, but on Tuesday's bounce above $15 and with Soros buying back in, ABX may be interesting again if it can hold that $14.69 level. The seasonality of precious metals tends to be strongest from January to May. Mining stocks often retreat over the summer and rebound into autumn, but did the opposite this year due to Brexit, Fed drama and other macro events. Until this winter's run starts, I am holding the miners I have while leaving some dry powder to now focus more broadly on writing about what I call juniors of substance. Last month I wrote about how speculating reactively in juniors is often a trap which I call Monkey's Dilemma. Unusual trading activity after news releases initially emphasize these small to micro-cap stocks. This gets them on my Hot Sheet radar but is rarely when I buy. As a contrarian investor I tend to wait for that volume and price spike to fade, and as a value investor I need to figure out what they really have after the algo-bots and day traders forget that news release and dump into the pullback. Winning at the markets avoids being a firefly thrill seeker but instead identifies value as a patient puzzle master, which can be just as seductive and fun. For example, my May article showed how (TSX:NDM)(AMEX:NAK) Northern Dynasty Minerals at C$0.45 per share has an amazing risk / reward scenario tied to a salmon workaround to get permit approvals. Now C$1.75, doubters must be surprised by the October 28 news that the EPA has agreed to FACA mediation. Imagine the shock if NDM gets a major joint venture (JV) partner for its massive Pebble Project in Alaska. Odds are better as multi-billion dollar developments with high paying mining jobs may soon Trump any EPA issues. Conversely, junior explorers always start with a great story ... and not much else. Most have nothing tangible other than cash and marketable securities that qualify as a worthy asset on a balance sheet. Shareholders value the story based on company presentations, newsletter articles or videos about a bunch of P's: People, Property, Price, Paper (share structure), Phinancing, Politics and Promotion. Investor relations (IR) highlight that there is no debt, which is not prudence but because they can't service debt and nobody would be crazy enough to lend to a company with no revenue other than share issuances. Although you may not have to worry about foreclosures, you still need to hope that accounts payables for insider loans, services or back pay don't grow and turn into cheap shares for debt. For example, (TSX:LN)(OTCBB:LONCF) Loncor Resources looked ok until they closed a 67M share private placement (PP) at a cent and a half, with the CEO now controlling near half of the stock. Over the past two years I have been selectively buying penny mining shares which have been beaten down 90% or more since 2011. I'm not just talking about share prices, their market caps were half to less than a tenth of shareholders equity. Assessing even balance sheet worthy mining assets can be complex, but when looking at many stocks this simple bear market cheapness guide helped me initially filter resource values which may again trade at multiples of book during mining bull markets. Cash is the easiest asset to value, and when divided by the fully diluted number of shares gives you a pretty good idea of what a shell stock is worth before it turns into a new story play. I own shares in a few penny shells bought for around cash showing on the balance sheet, with mining assets and no debt. My bet is that a left for dead shell may be reincarnated via reverse takeover (RTO) if it is clean and current on filings and fees, and tightly structured with a market cap of just a few hundred $K. RTO's are cheaper, faster and easier than an initial public offering (IPO). Shells can turn into highly leveraged, new pre-promotion plays. The risks are suffering through stock rollbacks and changes to the company's name, management, funding, assets, and sometimes the whole business focus i.e. mining to dot-com or marijuana. Some writers bet on so called zombie stocks, hoping that blown up mining plays with tons of shares and little equity or cash will still get revived. I prefer thin shells at cash and less likely to be rolled back again, as both usually end up RTO'd with a new play anyway. 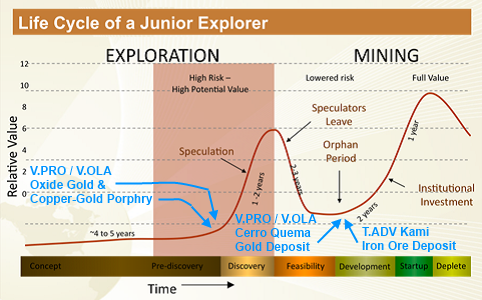 I focus on deeply undervalued penny producers and developers which haven't rebounded, or newly restructured junior explorers with a great story that hasn't played yet. When a miner looks cheap, I dig to try and figure out the stock's story chapter-by-chapter, act-by-act, while always looking for industry or company catalysts worth tracking and writing about. My process found these stocks early, and I'm probably the only newsletter writer on them right now. I own shares, so consider my reasons biased. One of the penny shells I bought shares in a couple of years ago was Red Mile Minerals. RDM had a gold Property in the Destor-Porcupine region of Ontario, a highly prospective area with lots of gold production that could be worth another kick at the can. I didn't really care about that, remember that I focus on cash, debt and share structure. If memory serves there was no debt, cash per share was close to the share Price, with only 25M shares outstanding and a market cap of $250K. This was ripe for RTO as taking a company public for around a $1/4M is cheap if they can get control of the stock. The Paper was tight enough that I did not expect another rollback. I was wrong as later that year RDM consolidated 5 old shares into 1 new share. That's not too bad as the standard rollback is 1 for 10, or worse. So I now have one fifth the number of shares and my average cost went from a penny to a nickel. I'm still glad the algo-bots were feeding me shares at a penny bid, as post rollback there was no size available at even multiples of my new cost. Renamed Orla Mining, shares are still tightly held. (TSXV:OLA) Orla Mining gradually moved up through C$0.20 on no real volume or news until June 27 as they announced an expected C$6M PP. Three things stood out to me, first was the size as C$6M is a lot for a brand new shell stock to raise. Second, the Price at C$0.50 was at a significant premium to where OLA traded at under C$0.40. This represented a double bonus of more cash with less share dilution. Going into even tiny capital raises these stocks often get smashed, with the PP then done at a discount to market. Third, how can they Promote and close a fairly large PP with no mention of any new People or Properties? I had my doubts until three days later when they increased it to C$7M. Chapter II started on July 8 with the completion of that C$7M PP. After the market close, another news release announced a change in company ownership, to include some of the biggest names in the mining industry. Most notably, Pierre Lassonde, co-founder of the world's first gold royalty business and is still chairman of (TSX:FNV)(NYSE:FNV) Franco Nevada, an C$80 stock with a market cap of C$14.3B, which has provided Buffett-like returns during good and bad gold markets. For five years until 2007 he was president and later vice chairman of (NYSE:NEM) Newmont Mining, the world's second largest gold company. Mr. Lassonde invests in miners, sits on various boards, was chairman of the World Gold Council, received the Order of Canada, won many industry awards and is in the Canadian Mining Hall of Fame, and as a philanthropist continues to give away millions. After such a bingo on the Phinancing and People, surely they have a great Property to roll in. While I rarely resist the opportunity to lock in at least some of a ten-bagger gain, how can I sell before at least seeing the new play? My rationale was also that these guys are major mine builders who don't invest for just nickels and dimes, so if they are getting in at C$0.50 then I should probably not be leaving. On no more news, OLA again quietly ripped higher, to around a buck by the end of the summer. Chapter III started September 14 on OLA's news of its merger with (TSXV:PRO)(OTCBB:RSPRF) Pershimco Resources. Just as exciting was to see a C$50M equity Phinancing at C$1.75 per share, a huge raise at an amazing premium to OLA's C$0.81 close. No worries about funding this time either, with the deal back-stopped by Mr. Lassonde and other insiders participating for up to C$30M. Again, why sell with the key People investing heavily at C$1.75? Just two weeks later the entire book build was done, with firm interest beyond C$50M. On October 13 the PP closed with insiders taking 44.1%. Now I need to know what Pershimco has, their plans, and when the merger closes? Both sides must be confident as the merger news also has OLA investing C$4M in a PRO PP at C$0.33 per share, which closed September 26 with no finder's fees or warrants, or any condition that the merger even closes. This PP was also at a premium to market, and I was happily getting my PRO bids filled by the algo-bots at C$0.25. PRO shares may have arbitrage value just on the merger terms getting done, as they convert to 0.19 and 0.04 NewCo shares with a deemed value of C$0.4025 based on OLA at C$1.75. PRO's June balance sheet seems clean with C$6.6M cash versus C$2.4M current liabilities, and with C$75.5M assets versus C$20.4M long-term debt. Shareholders equity is C$60.8M, not including the C$4M PP cash injected in September. PRO's market cap is C$76.8M at C$0.26 per share, or barely above book value and at a discount to the last PP Price. The sum of the parts combined merger value roughly suggests around C$235M based on the net present value (NPV) of PRO's resources and the cash in both companies, less a guesstimate on expenses. If correct, this works out to around C$1.85 per OLA share with 126.7M shares anticipated as the merger closes, plus huge exploration upside! PRO's fully-owned Cerro Quema Project in Panama has a gold oxide heap-leach production scenario in the last stage of permitting, and a copper-gold porphyry target. Their website shows a potential world-class deposit with 878,700 ounces so far, after-tax NPV of C$176.3M, 41.4% IRR, a low cost, open pit operation of over 100K gold ounces in year one. As for exploration potential, PRO has a 15K hectare concession, a 17km trend to expand gold oxide resources, plus gold and copper in sulphides below the oxide caps with 12km of strike length to pursue a prized copper-gold porphyry system. Some throw around the term world-class deposit with buyout potential. When true, major producers and institutions usually know about the play and have a stake. PRO's top shareholders are: Sentient Funds, AGF, Goodman & Co., RBC Asset Management, and especially (NYSE:AEM)(TSX:AEM) Agnico Eagle Mines. I'm looking for shareholder approval at the end of this month, and Panama's Ministry of Environment approval by the end of January. Post merger, with over $50M in the kitty, I want to see lots of news flow from mine development to exploration drilling for more oxide gold, to hopefully discovering a major copper-gold porphyry. V.OLA closed at C$1.42 and V.PRO at C$0.26. This typical mining cycle chart is similar to Pierre Lassonde's in "The Gold Book: The Complete Investment Guide to Precious Metals". In blue I point to where I think OLA / PRO and ADV are. (TSX:ADV)(OTCBB:AXXDF) Alderon Iron Ore is a stock that I didn't think I would be writing about for another year or so. I mean my dime bids were getting algo-bot fills every so often, but who wants to hear about a deeply undervalued development play trading near decade lows, with next to no volume or news, and in the least sexiest sector. Some days ADV didn't trade and a good day is 100K shares. 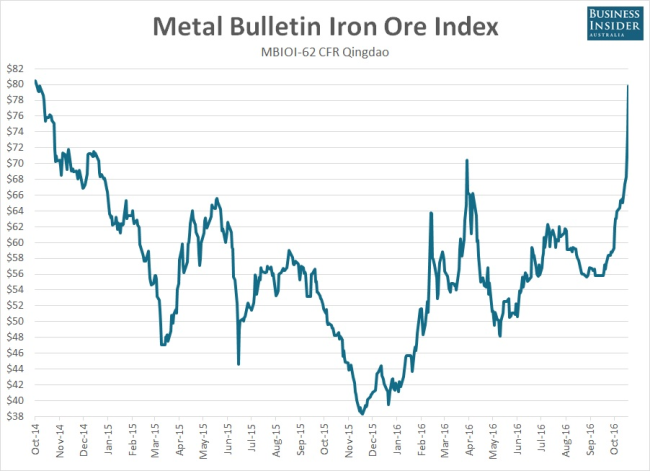 However, this changed a few days after their October 19 news sank in, and as iron ore spot prices soared to three-year highs of over $80 a ton on Trump's win, doubling its $38 low a year ago. ADV is updating its preliminary economic assessment (PEA) for Q1 next year based on a new Kami Mine concept incorporating the nearby idled Wabush Scully Mine. Kami is located in Canada's safe Labrador Trough, with modern infrastructure near other mines, rail and ports. The re-scoping should provide various capital and operating costs savings to help ADV 75% and its strategic JV partner Hesteel Group of China 25% (World's second largest steel producer) advance Kami's development. (NYSE:BHP) BHP Billiton, (NYSE:RIO) Rio Tinto and (NYSE:VALE) Vale are the world's largest producers of iron ore and other metals globally, whose shares have doubled or more this year. With market caps of $40B to $100B, any one of these could easily gobble up tiny ADV. Kami offers a cheaper, high grade ore body compared to more costly, lower grade, dirty deposits in South America, Australia and elsewhere, but Hesteel also has deep pockets and needs quality iron ore to make steel. After looking at junior iron ore development plays, ADV's financials and story seem to offer the most compelling combination of deep value and potential, with some really big government supported P's as the story reawakens. Their website shows feasibility study highlights of: 8M tonnes per year at 65.2% iron, $1.27B capital cost, $42.17 per ton operating cost, 29.3% pre-tax IRR, $3.24B NPV8, 3.8-year payback on a 30-year mine with 669Mt P&P reserves, 1.275Bt M&I and 523Mt Inferred. ADV's 2015 balance sheet is what first caught my eye earlier this year. At a dime per share the market cap was only C$13M, or at today's quarter shares the market values ADV at C$34M. September shows C$38M cash, C$206M assets and C$20M debt. Shareholders equity is just under C$185M or C$1.40 per share, which means that my C$0.10 shares were at 1/14th of book value, about 1/3rd of cash alone, or at less than cash after repaying all the debt. Today's C$0.255 shares still cost less than a fifth of book. ADV was added to our Top 30 Small-Caps at a dime this summer, and posted on our Hot Sheet on the news and spike to C$0.48 last month. After a sharp 70% correction to C$0.20, ADV remains active on no news, so it may be a good time to share why I like this near-term value play. Gotta love them algo-bots when they keep feeding my bids cheap stock. It's also nice as a great story comes together, and both of these plays have quality assets with sound financials and lots of big P's already in place. I have a few more moonshot plays that run the gamut from RTO penny shells, to deep value, to exponential growth potential, if you care to comment and let me know your interest?